Talon 1 I purchased this bike for £750.00 in 2017 It handles every terrain you throw at it and loves it. It really comes into its own on the trails and will put a smile on your face and keep it there all day. 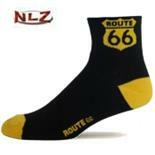 It's quick, the gears are smooth and the disc breaks are very responsive making the ride enjoyable. Steering is nimble and assured. I love this bike! None. Just the purchase price. I bought my Giant Talon 5 2014 model back in Oct' 13 for $550 AUD.. So I reckon I've had a good chance to test it. Firstly, for what it is, this bike far exceeded any of my expectations. To this day, it still shifts well, handles well on and off the trails, will take jumps in its stride and so on. I now own a 2017 Specialized Stumpjumper FSR which has replaced it as my main trail bike, but on the occasion when I do take the Talon out, will will still keep up with the Santa Cruz's, Specialized and Ibis bikes of the guys I ride with just fine. 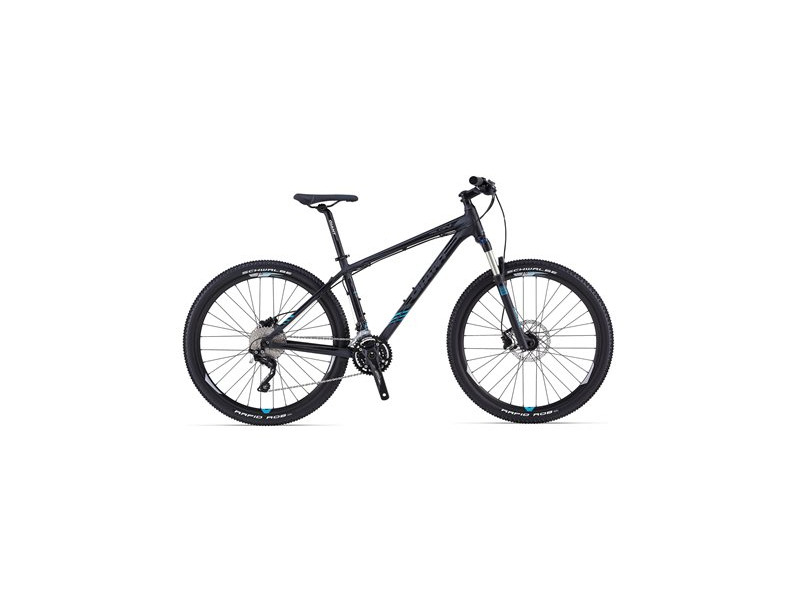 To take into consideration is the price with these bikes, you won't be getting a full suspension on anything like that, but in my case, has still have a reliable bike which I can use and have used thus far, without replacing any parts but the tyres. On the note of tyres, I run all Maxxis, with Maxxis Forekaster 27.5x2.35 on the front, Maxxis Aggressor 27.5x2.30 on the rear. This paired with Maxxis Freeride 27.5x2.2-2.5 inner tubes, I've not had a flat in about 9 months or so. The brakes on the bike have been excellent, only needing to be bled and redone this year. Aside from it being a hard tail and thus limiting its ability to soak up those hits that travel straight up the seat post and into your clacker, the only real weaknesses with the bike are the SR Suntour XTC coil spring forks, which have a slight bit of movement at 4 years of heavy use, and the 3x8 drivetrain - makes quite a bit of noise (chain slap and all) and at time has had some sissies shiftIng, but nothing a quick tune-up can't fix. Overall, it's a pretty damn good and durable bike for the price point. If you compare it to a FS MTB, you will be disappointed. 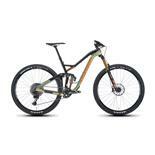 If what you're looking for is an XC/ hardtail trail bike, this will fit the bill. I have dabbled even into intermediate (blue square) downhill with this thing, and although uncomfortable, it handled it and it never felt unsafe. A solid and well-lasting bike for $550. Reassuringly in touch with the ground. None so far, after two years. Absolutely love this bike. More than enough for anyone getting back in the saddle, or even in the saddle for the first time. I'm 240 lbs and it behaves beautifully. Control is excellent, ride is great. No adjustments needed for the first 18 months. A pleasure to ride. Disc breaks, Tektro levers, etc, are precise and the running gear is smooth. So Ive had this bike for 4 days and I haven't been out on the trails yet when I got this bike it was muddy so I rode it on the driveway and like how low the gears were. So I put it in the shed and the next morning was low, so I aired it up and let it be. The next day me and friend went out riding on the rode again my tire was low so we went to his house and filled it up then we proceeded to bike 5 miles back to my house we rode in the grass did some small 5 foot jumps on to a landing and a 1 foot drop on to a landing. The person at the bike shop said it will be fine for that and it felt great. So I get home and look at the tire it is completely flat like 1 psi in it so I while I was looking the sidewall I noticed the wheel was cracked so I didn't even bother taking the tire off so I called my bike shop and they said they can replace it when I bring it in. I don't if this is due to the bike shop not checking the bike over well enough (because they built it that day) or from the small jumps over all I may not buy a bike from giant again or mabey not that bike shop if it is in your budget I would recommend the Raleigh tokul 3 instead. If you are using this for xc only and like no jumps this is great but if you are doing riding such as me I would get the bike I mentioned earlier. If this was a defective wheel and I don't have this problem again I will update this reveiw if I figure out how but as it is that is what I think of this bike. This is my 7th mountain bike since 1993. It is by far the best I have owned as this things is fast on the trails with minimal pedal power. I have the 2015 Talon 2 which I got for $1,020 brand new. 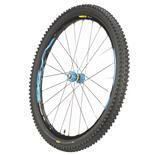 I have the 27.5" tires and that seems to be a good fit for me (I have the medium size). The stock hydro brakes will work well. It is the Auriga brakes. 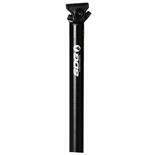 Comes with Deore shifting components which is top of the line for mountain biking. 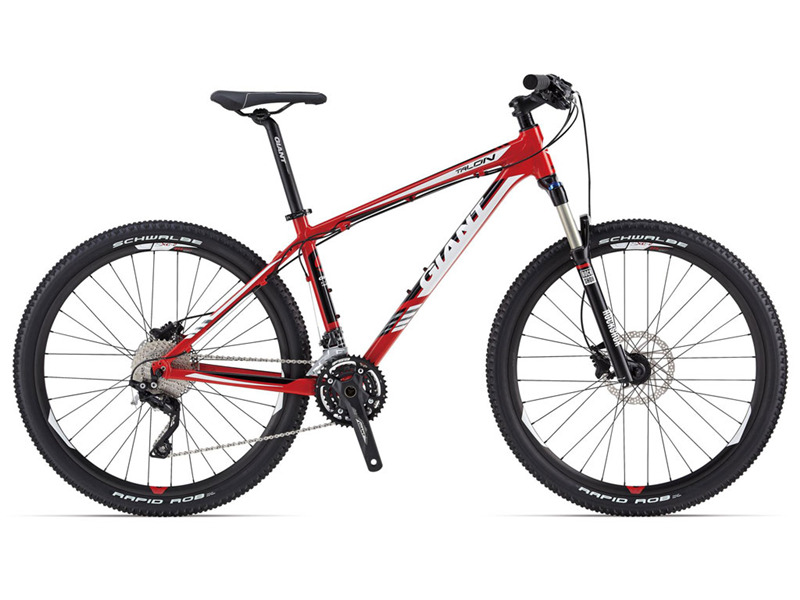 This is a versatile bike that can be ridden on dirt trails and pavement. I even purchased a headlight so now I can hit the rail trails at midnight (night riding is a blast!) The Talon line up comes in 4 models with price ranging from $600 to $1,400. 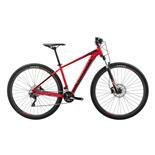 If your looking for a top of the line sport hardtail- the Giant Talon will serve you well. Just echoing the review by Todd on 1st August 2015. The Talon 4 is my first new bike, I'm early 50's, and have been mountain biking around 20 years. The bike was a run out 2015 model and cost New Zealand NZ$675 replacing my old second hand Bauer Devils Peak.The bike is incredible value for money for someone wanting to get back into the mountains and trails to just ride without doing the party tricks. I'm 6'.3" and the XL size with the Talons wider handlebars, 27.5 wheels and hydraulic brakes are just perfect. Don't pay too much attention to reviews talking about "lower end of the scale" componentry as we're not all world champions. Buy a bike based on affordability and a realistic view on what you hope to achieve - for me the Talon 4 ticked all the boxes. Light aluminum frame, 27.5 wheels (awesome), brakes are great. Front fork is stiff and heavy. Decent components for the price for sure...smooth shimano shifters and drive train. Love the hydrolic brakes. Great looking bike with a solid frame and quality paint job. Like the quick and easy lockout for the front forks as well. 27.5" tires roll beauty and climbs well. An excellent 'entry level' quality XC hardtail bike. Only put about 30 hours on the bike so far but zero complaints. Front shocks a bit stiff at first but a quick adjustment for my weight solved that. This is my first new bike in over 20 years. I'm in my mid 40's now and quickly realized when began to research things just how far bike technology has come over that time. Honestly it was a bit overwhelming. So many manufacturers and an enormous amount of different levels of components. My Talon is actually a 2016 model. I live in the interior of BC Canada which has become a mecca for all types of XC and downhill biking. We had an early spring and our local stores quickly started selling out of 2015's which forced some companies to start shipping the newest models to meet demand. My bike was $730 canadian...an excellent value for the money. It suits my moderate XC riding beautifully, great on roads and trails. I would recommend this bike for anyone getting back into biking. It wont break the wallet, performance for the price is outstanding, and the resale by the looks of things is good too if you decide to upgrade. Very difficult here to find a used Giant of any level. (good sign) Great bike!